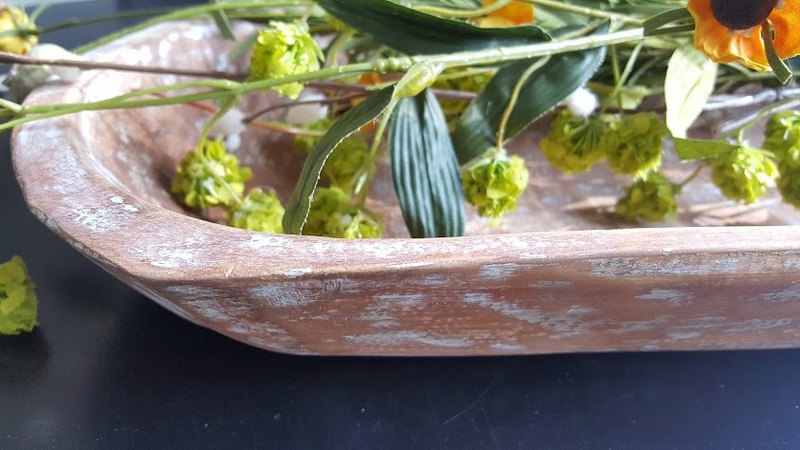 As one of 30+ bloggers participating in the Thrift Store Décor Challenge this month, I am excited to share how I took a wooden bowl and turned it into a knock off dough bowl. When you get to the bottom of this post you will be treated to some serious creativity so please hop around to each blog and get to know us. 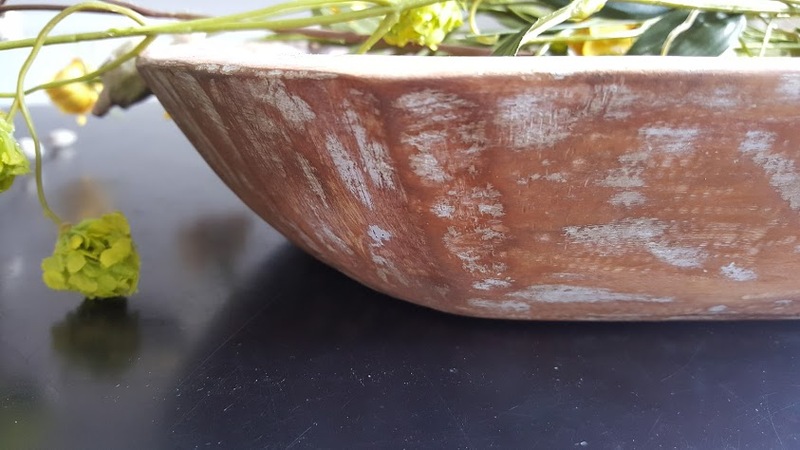 Today I am going to show you how I made a knock off dough bowl but first let’s talk about the history of this rustic, wooden bowl that adorns the farmhouse tables of the home decor community. 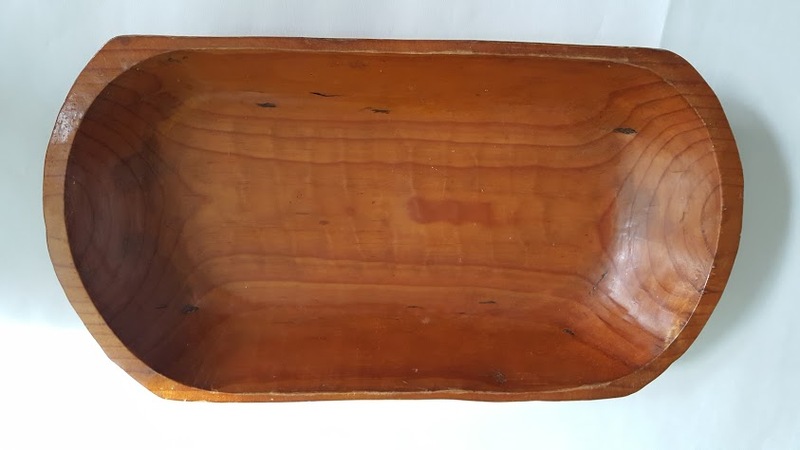 A traditional dough bowl, also known as a bread trough, is typically a shallow, wooden bowl hand carved into a rectangular or oval shape. 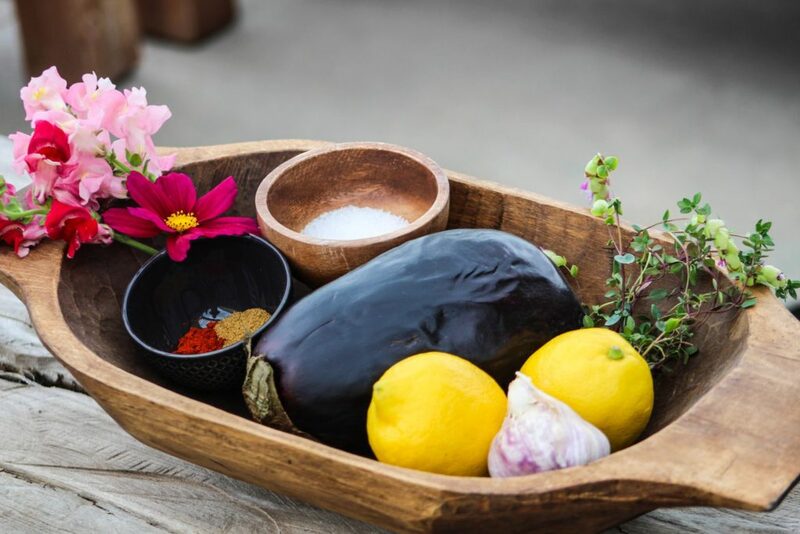 Over the centuries it has traditionally been used to make bread by many different cultures across the continents. After the bread ingredients were mixed in the wooden dough bowl it would be left snugly in the bowl to rise until it was time to be baked. Wooden dough bowls were handcrafted into various sizes and were often passed down through the family. 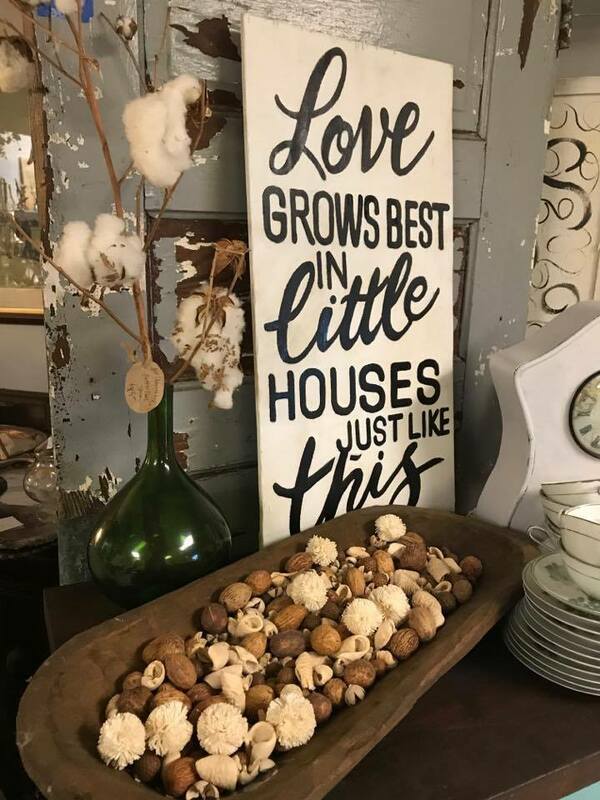 As you know, I have moved coast to coast and in my travels over the years I have seen tons of these bowls at the flea markets and thrift stores but never had any interest in them because I thought it was too primitive looking for my decor. That was before I fell in love with the farmhouse look and way before my flea market style had evolved into how I decorate my house. 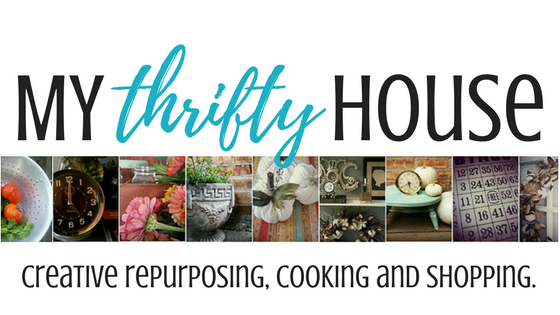 I love the look of anything worn, well used and oh so very loved with a great story and the wooden dough bowl checks all those boxes but the price most definitely didn’t fit into my thrifty budget. Yes, you can purchase a dough bowl on Amazon but you’re going to pay for it. Look at these prices below. After I got over the sticker shock of the prices being asked for the dough bowls I did what any DIYer would do. I headed straight over to Pinterest to do some research. 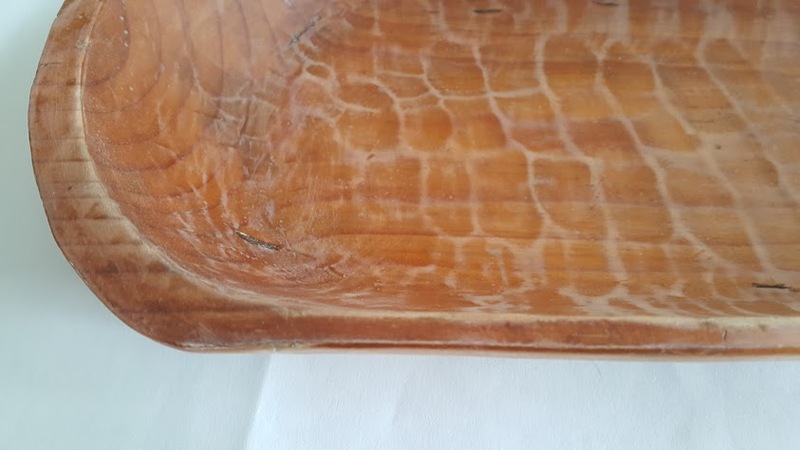 I also kept my eyes open as I scoured the flea markets and thrift stores for a dough bowl and then one day I came across a rectangular, hand carved, wooden bowl that looked a lot like a wooden dough bowl but it was just a decorative bowl from a big box store. It was the right shape and size but the orange, shiny color was all wrong however, I purchased the bowl for $5 because I knew I could make my own knock off wooden dough bowl with some of my homemade chalky paint and sandpaper. I started by sanding off the shiny varnish with some heavy grit sandpaper. As you can see after the sanding the texture and hand carved details were much more noticeable. I added a layer of my homemade chalky paint in a light aqua blue color and let it dry for about an hour or two. Then I went to town sanding and distressing the dough bowl until it looked rustic and worn like a well used vintage dough bowl. For the last step I rubbed it down with some antique wax which really made the distressing and patches of chalky paint pop along with all of the texture and hand carving. I started a Pinterest Dough Bowl Board to capture all of the unique ways people are decorating with this handy bowl that is now being used for anything but making bread these days. 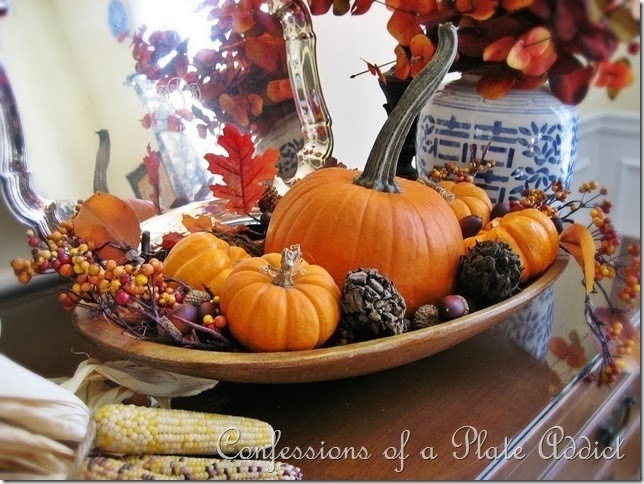 I have also gathered some ideas from my friends to see how they are using their dough bowls in their home decor. Good stuff below and I have a lot to learn from them when it comes to styling my knock off dough bowl. 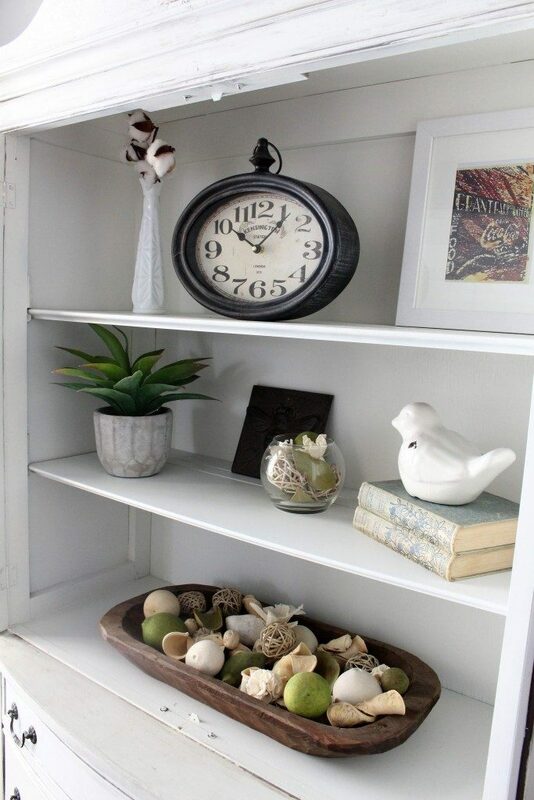 This entry was posted in DIY Projects, Home Decor, Thrift Store Decor Challenge. Very cool Denise! I don’t know much about the dough bowl either but I feel like between my mother and mother-in-law, I should find one in their homes! Visiting from Thrift Store Challenge. Oh that would be an awesome keepsake if you found one from your family. Thank you so much. I am pretty happy with the outcome as well. I’ve always wanted a dough bowl, but yes the prices are outrageous! Now I’ll have to keep an eye out for a bowl I can repurpose! Outrageous prices is right. Good luck on your treasure hunt. It was so easy to make the knock off dough bowl. Good luck on your treasure hunt. I love dough bowls but have never found one at the thrift store. Ours don’t have nice things like that. Thanks so much for sharing my Christmas centerpiece! Hi Angie….I love your Christmas dough bowl. Thanks for letting me include it in my round up. Yes, the prices are crazy but as you can see it’s easy to make a knock off of your own. Thanks for the invite to your link party. Thanks for joining Vintage Charm, you’re awesome! Thanks for the invite Kathleen. Congrats, Denise — I’ve chosen you to be featured at tomorrow morning’s Vintage Charm Party #94! Great makeover. I will keep an eye out for a bowl like the one you found. I always find the darker leaf shaped bowls from the 70’s. What’s funny is I went to Maui this summer and was in a gift shop and saw those leaf shaped bowls and if they are made out of Koa Wood wood they are worth a pretty penny. Great project! I see those leaf bowls all the time too. Let me know if you find a bowl to a knock off dough bowl of your own. Wow! 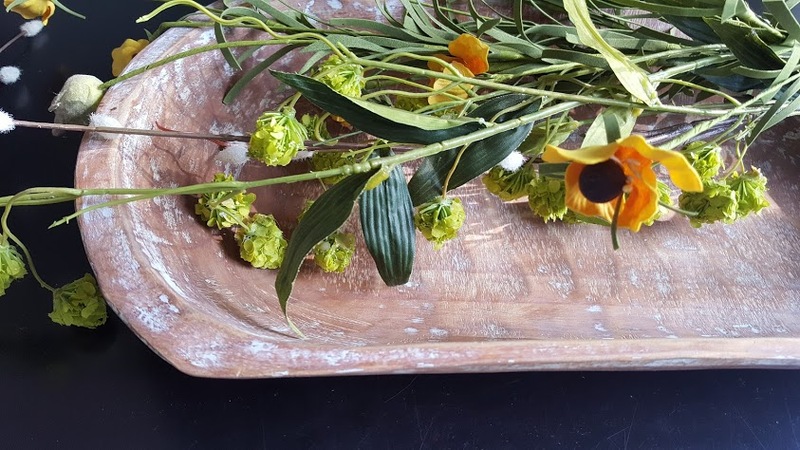 You did an amazing job transforming that shiny orange wood into a farmhouse dough bowl beauty. Lovely project. Thank you for visiting Sue. I am quite happy with how it turned out. 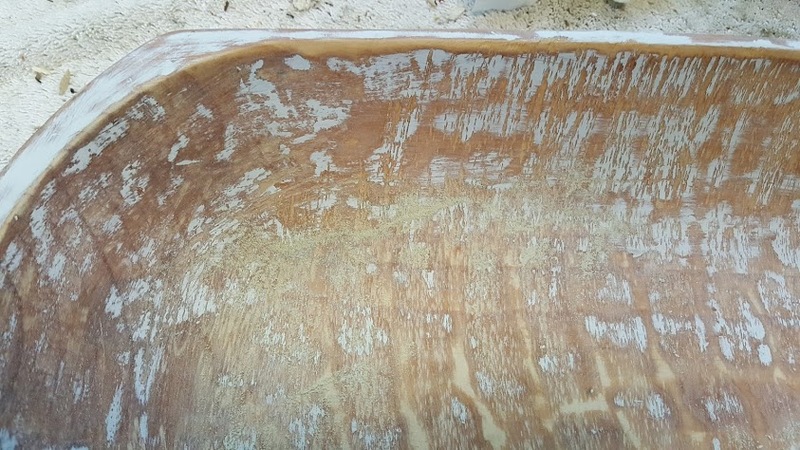 Great job on making the dough bowl more primitive. I got tired of mine and put it up but you have inspired me to pull it back out. Yeah…glad I inspired you to use that dough bowl. You really did it! I was wondering how it could be done before I read it. What an innovative idea, and it looks just like the real thing! I’m with you….I’ve never bought the real thing. I don’t want it bad enough to pay the prices they ask! Visiting from the Challenge & enjoying the posts…I’m Florence, the one with the white sconce turned into a planter. Thanks for your kind words Florence and I am glad you liked my dough bowl. This is gorgeous. I had no idea these dough bowls costs so much but I am in love with them as well. I am going to keep my eye out for one that I can re-do. This is such a brilliant idea! Aren’t prices crazy? I guess that’s what people are willing to pay for a piece of history. I love that you gave the history of the dough bowl! I had never thought how pretty it would be as a center piece! 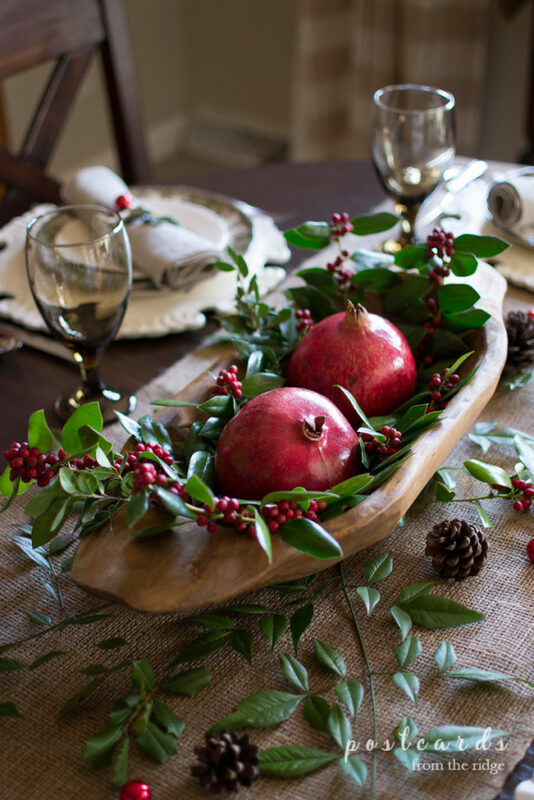 I really love it with the Pomegranates! Thanks for visiting. I like the pomegranates too and there are tons of ideas on Pinterest as well. Oh man you scored when you found that bowl! The texture really shows through after you sanded it. It looks so much better and more authentic without the shiny orangy look. 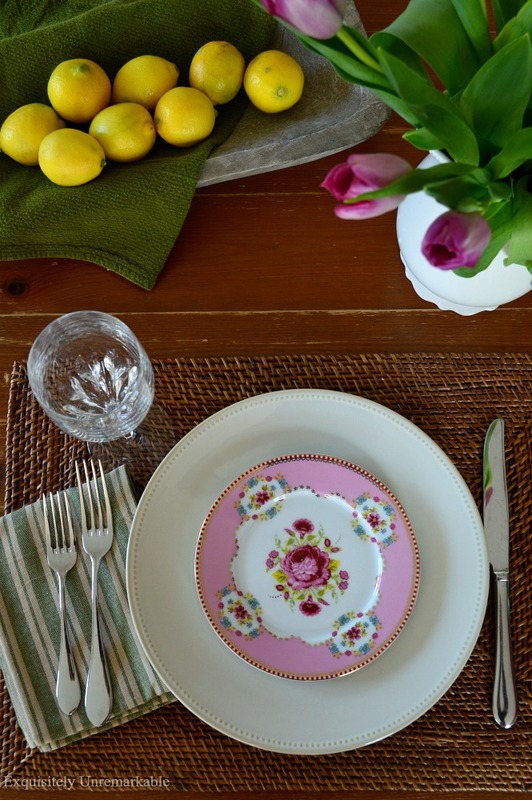 I bet it will be a wonderful centerpiece on many tablescapes for years to come. I have always wanted a dough bowl. Gotta look for something like this the next time I’m thrifting. Awesome job! Thanks so much. Good luck on finding the perfect bowl for a knock off. 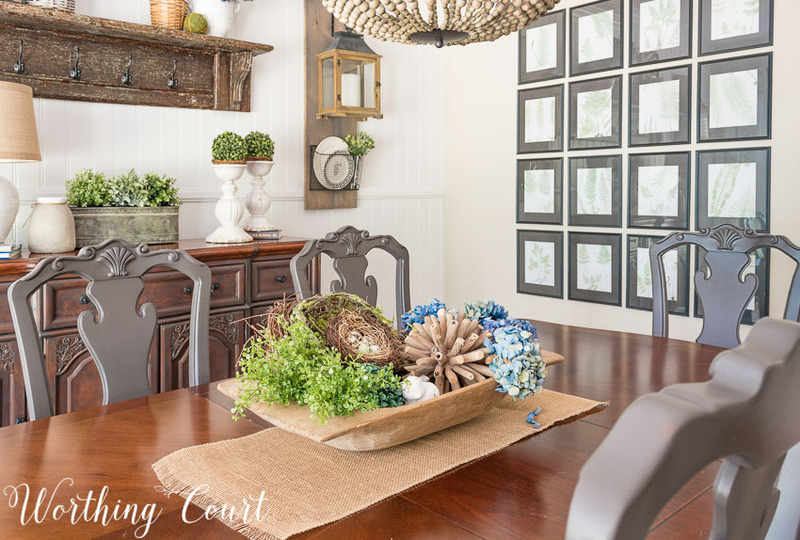 Thank you Kim…I seriously love the look of the dough bowl and love how you styled it on your table. This bowl i gorgeous. I have never actually seen one so of course I want want very much. This makeover is fantastic. Love everything about it. What a fabulous idea!! I love the textured look that you gave it Denise!! Fabulous job! !